After a good nights sleep, Day 2 started at the top of the Volcano and would end 172 miles north in the town of Hawi. 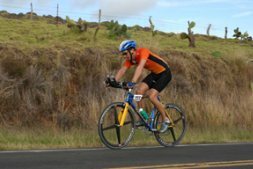 Day 2 requires strong biking skills because of the distance as well as the hilly terrain. The last 10 miles are especially arduous because there is a long climb to 4000 feet above sea level that goes up, and up and up. As Philip was burning up the hill the rest of us had a chance to enjoy the expansive view below of the surrounding countryside. The Big Island of Hawaii is unique because on one island it contains all the climatic zones of the world except for the cold ones. So you have desert, grasslands, mountain and rainforest all on one island. That is what makes the Big Island so popular; the diversity of geography and climate. We continued our support duties keeping Philip hydrated and fed throughout the day. Philip is a strong biker and it was remarkable to watch him do so well especially at the end where the climb is extreme. Having participated in MS 120 mile charity bike rides over TWO DAYS, the thought of 172 miles over one made my legs hurt just thinking about it. 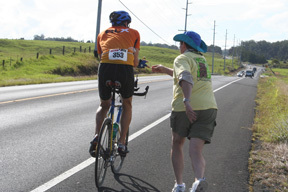 Philip was a having a little trouble with his right knee so several times during the day he stopped for bathroom breaks and leg first aid administered by yours truly. 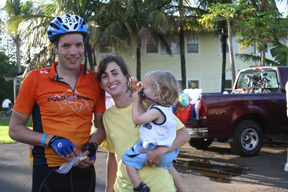 Philip finished Day 2 in 9 hours and 58 minutes in the town of Hawi. Immediately after getting off the bike, I did some passive leg stretching with him; we carbo loaded with cold spaghetti and then it was straight to the massage table for some badly needed work on his legs. After massage and dinner, it was off to bed for a good nights sleep in preparation for the hardest day of all, Day3.